Lizanne Schweren, a Postdoc at the University Medical Center Groningen, and colleagues published a paper in JAMA Psychiatry this morning showing that the connectivity of depression symptoms is, in contrast to what a prior paper found, not a predictor of treatment response. This is the first non-replication in the psychopathology network literature I’m aware of1. And end with a call for a multi-sample high-powered replication of this effect, and add some further considerations. 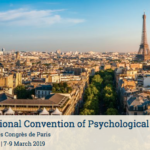 Back in 2015, Claudia van Borkulo, a postdoc in the Psychosystems Group in Amsterdam, and colleagues published a paper entitled “Association of Symptom Network Structure With the Course of Depression” in JAMA Psychiatry2 that has gathered nearly 80 citations since3. In the paper, the authors took 515 participants from the NESDA cohort with last-year diagnosis of MDD, and split the sample into two groups at the follow-up timepoint 2 years later: treatment responders vs treatment non-responders. Van Borkulo et al. 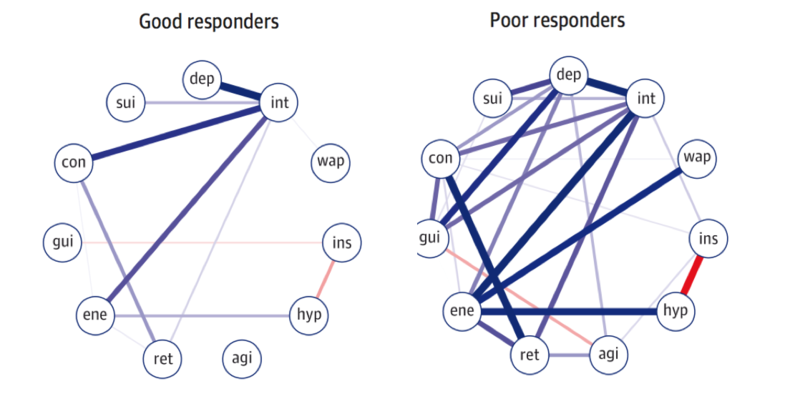 then estimated network structures at timepoint 1 for these two groups, and found that the non-responder group at baseline had higher network connectivity than the responders, i.e. the absolute sum of all edges in the network structure. The test statistic for the difference in network connectivity was 1.79 (p = .01). In two sensitivity analyses, the test statistic remained significant (analysis 1: 1.55, p = .04; analysis 2: 1.65, p = .02). So what is global connectivity or global density, and why might it be relevant? 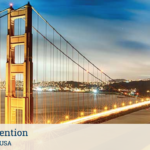 Connectivity is the sum of all the things going on in a network structure, and it depends on what kind of network you have to make sense of it. In a temporal network collected with time-series data, for instance, you could add all temporal cross-lagged effects per patient (sad mood predicting anhedonia; concentration problems predicting sleep problems; etc. ), and then see if there is more going on for patient A than B. You could add to that the autoregressive coefficients (sad mood on sad mood; anhedonia on anhedonia), and then you’d have a measure of temporal density. You could interpret this of sum of “activation” carried from one time-point to the next, and compute some kind of R^2 (if the temporal connectivity is 0, then you also explain no variance of one timepoint to the next). In cross-sectional between-subjects networks, connectivity is simply a sum of all absolute edge values4. It means that, in a given population, items tend to have stronger conditional dependence relations, which usually also means items have higher correlations; in a factor model perspective, this can translate into higher Cronbach’s Alpha, i.e. scale reliability. How do you compute global density? 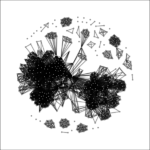 You can download a freely available example dataset here, including code5. 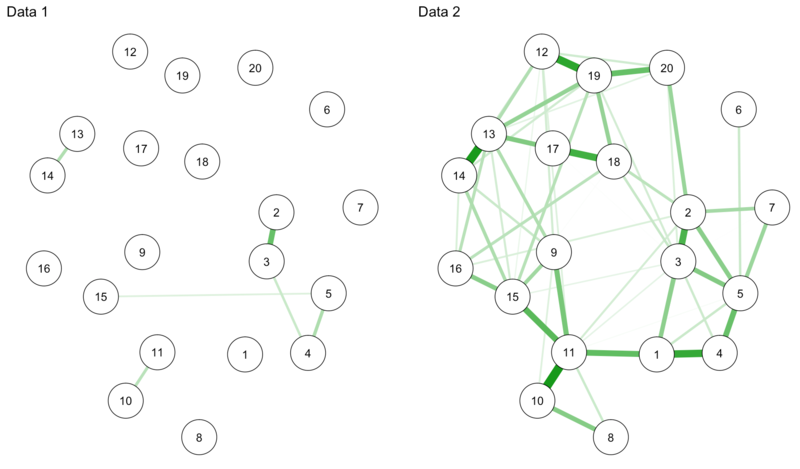 We load the data, estimate a network, plot the network (not shown), and then compute connectivity. We have to divide the absolute sum by 2 because all edges are encoded twice in the adjacency matrix (A with B but also B with A). How do you compare global connectivity across two networks? Claudia van Borkulo developed the Network Comparison Test (NCT) for that purpose. First, let’s split our data into two sub-datasets that we want to compare. Haha … I swear I only split the data once (back in summer this year! for a workshop in Spain), so for this tutorial, from an educational perspective, I guess we’re lucky we get so pronounced connectivity differences. The first line replicates connectivity that we estimated by hand above; the second lists the difference that was used as test statistic in the permutation test; followed by the p-value. We now have a perfect example showing that the NCT requires sufficient power to detect differences between the connectivity of two networks — because networks that do seem to differ in connectivity (both graphically and statistically), as in the example above, are found to be identical in connectivity due to the small sample size here (Claudia shows this clearly in her NCT validation paper that is, I believe, still under revision). So if the NCT is non-significant, and you have two small samples, this can mean that there is no difference, or that there is not enough power to detect the difference. This is important to keep in mind. 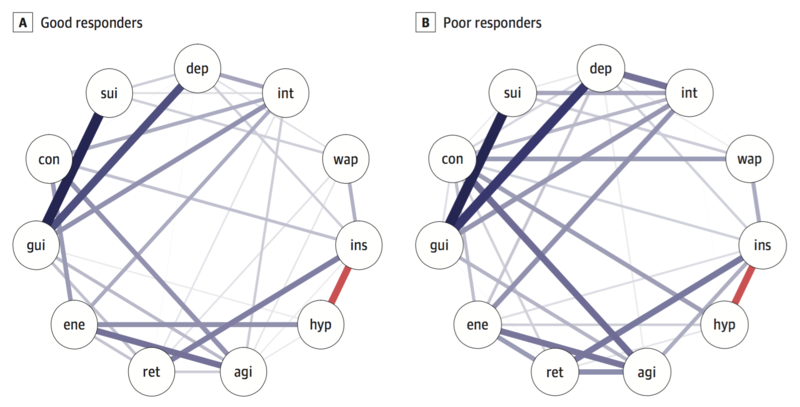 Global connectivity was higher in poor responders, similar to the paper by van Borkulo et al., but the difference was not significant (good responders, 3.6; poor, 4.3; p = 0.15). It’s very cool to see critical replications and non-replications, and I think we should do that much more for substantive findings that might be relevant. For this particular effect, I am still not convinced what to think, given the fact that the result went into the same direction, and the connectivity difference between networks wasn’t negligible. How about we write a high-powered follow-up study with multiple larger samples? I have the STAR*D data lying around (~3500 patients) I could contribute, if anybody is interested to replicate this with higher power: let me know, let’s join up, let’s do it. Code from two papers, expertise, and plenty of co-authors interested in this are available! And I’m sure I’m not saying too much if I include Claudia and Lizanne here as potentially interested candidates for collaborations ;)! One fairly severe complication is that in the tutorial above, I used CorMethod=”cor” when estimating networks for simplicity, which forces estimateNetwork() to use Pearson instead of polychoric correlations for the skewed ordinal items in the data (these are PTSD symptoms in a subclinical sample, so substantial skew). This is, of course, inappropriate. 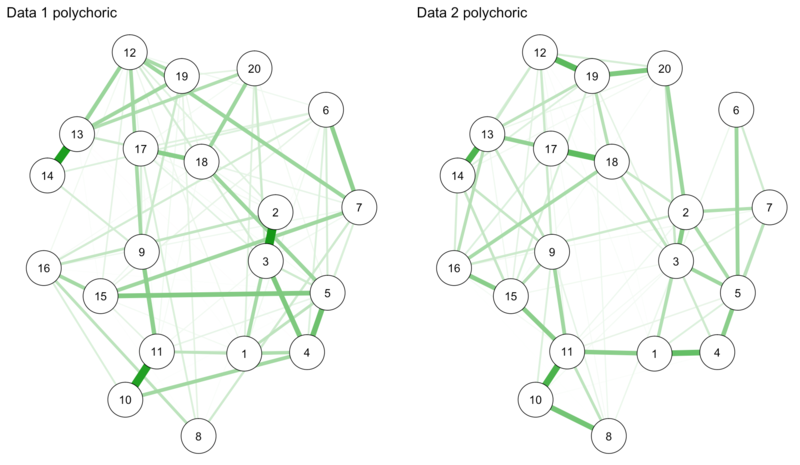 If I repeat the analysis with polychoric correlations, the connectivity for the networks is 8.30 vs. 8.38, very much identical (compared to 0.54 vs 5.79 that we got from the Pearson correlations, a pronounced difference). The strongest edge is now 0.48 instead of 0.28. The results change dramatically, which implies the importance of looking at the distribution and type of your data, and make sure you use the appropriate correlations. Sacha Epskamp and I describe this in some detail in the FAQ of our new tutorial paper on regularized partial correlations forthcoming in Psychological Methods. 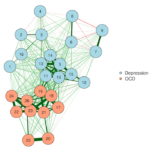 There is considerable evidence, across numerous datasets I reviewed in a recent empirical, and also in two very large datasets I studied for that paper, that network structures of depression symptoms in healthy people are more highly interconnected that network structures of depression symptoms in depressed people6. Many explanations have been offered for this, and although I’ve worked on this for over 3 years now, I really haven’t figured out how to make sense of these findings, or how to make sense of them in relation to the findings by Claudia and Lizanne. If you’re interested (or have suggestions to offer), I summarized the paper in this blog post. Not because all other results replicated, but because so far work has been largely exploratory and there are none to very few (depending on where you stand) real ‘findings’ except for “this is the network structure in dataset X”; but it’s early and I haven’t had breakfast, so I might have my grumpy hat on and regret writing this after my first coffee. This is pretty much the number of all network papers since, so it’s an incredibly well-cited paper. From: Armour, C., Fried, E. I., Deserno, M. K., Tsai, J., & Pietrzak, R. H. (2017). A network analysis of DSM-5 posttraumatic stress disorder symptoms and correlates in U.S. military veterans. Journal of Anxiety Disorders, 45. http://doi.org/10.1016/j.janxdis.2016.11.008. Network models do not replicate … not. Thank you for this tutorial and for sharing your impressive work online! 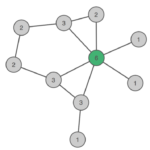 I’d like to perform a Network Comparison Test on a dataset consisting mostly of mixed ordinal data, but with a few continuous variables. Would this be a problem? 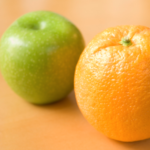 Which type of estimator should I use? Thanks for any help you can give. Hi Ale, to my knowledge the NCT is implemented only for Gaussian Graphical Models and Ising Models, but not Mixed Graphical Models. 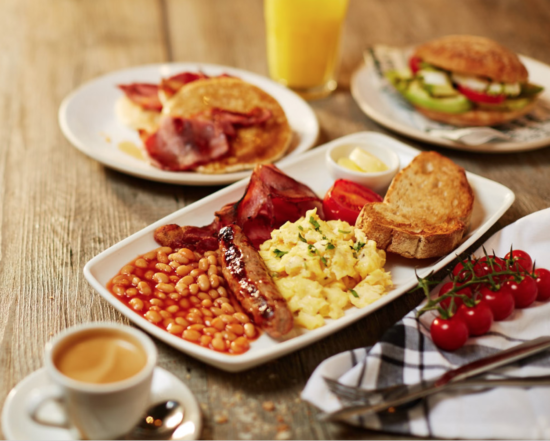 Thank you so much for your brilliant posts! As a student who is a complete newbie in network science, I’ve found them incredibly useful! I’m wondering if you have any advice about how one can compare multiple networks (in my case three) in terms of global strength and connectivity. 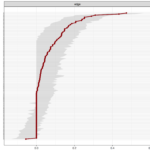 I understand that the Network comparison test as implemented in R can be used to compare two networks at a time. Would it be feasible to compare the outputs from a pairwise comparison and apply and multiple comparison corrections? Or perhaps there is a better way to achieve this. Any advice, links, reading would be much appreciated! Hi Sylvie, thanks for the kind words. We had the same question for a paper that was published very recently, where we wanted to compare 4 networks. We went for pairwise comparisons without correction for multiple testing for the NCT, accompanied by correlating adjacency matrices and centrality rank order. Combined, we believe that these metrics provide a fuller picture. You can find the paper here. Supplementary materials contain a) all code on how to do all of this, and b) the correlation matrices of the data so you can fully reproduce the main analyses. Thank you so much. This was very useful!